Many commercial cleaners contain toxic chemicals that are hazardous to our health and to the environment. Chemicals in common household cleaners have been found to induce occupational asthma, reduce fertility and birth weight in mice, reduce embryo survival in fish, reduce sperm count in adult men, and cause allergies in children. This list only includes some of the proven effects of chemical cleaners. There are no studies on the effects of long term exposure to these chemicals or the effects of the interaction of chemicals in our environment. We need to balance our need and desire for cleanliness against the effects these chemicals have on our health and the environment. What this article seeks to do is look at the science to determine if natural cleaners are a viable alternative. In order to determine if we can replace the chemical cleaners that we find on supermarket shelves with natural cleaners, we need to first define what we expect to accomplish by using cleaners. Generally, cleaners should remove dirt and maintain hygiene. I expect cleaners to perform three specific functions: (1) eliminate germs, (2) mask or remove odors, and (3) loosen dirt and grime so it can be washed away. The failure to remove bacteria from food preparation surfaces can have implications in the transmission of food borne diseases. Many anti-bacterial cleaners have been developed to provide convenient cleaning of food prep areas, replacing the proven method of washing with detergent and rinsing with water. Our excessive obsession with eliminating germs by using anti-bacterials may be having adverse consequences on our health. Germs may play a role in developing our immune system, the fewer germs people are exposed to in childhood, the more vulnerable they may be to sickness as adults. More worryingly, Anti-bacterial soaps, cleaners and toothpaste have now been shown to weaken muscle function by interrupting cellular communcation necessary for muscle contraction. The primary benefit of anti-bacterial cleansers is their ability to provide us with peace of mind by guaranteeing the elimination of germs. This study from the University of Florida shows that anti-bacterial cleaners are able to eliminate 99.99% of E.coli, Listeria and Staphylococcus bacteria from surfaces. In comparison, a mixture of 1 part vinegar, 1 part lemon juice, 2 parts water and pinch of baking soda was able to eliminate 99.9% of these same bacteria. This test involved innoculating surfaces with bacteria and then spraying or pouring the cleaners on the infected surfaces. The surfaces were not washed or rinsed (the proven, traditional solution). From this study, we can conclude that natural cleaners can be highly effective in reducing germs (but is a statistically significant 00.01% less so). The acidic nature of vinegar makes it a good disinfectant that is also effective against mold. Baking soda acts as a cleaning agent because it is a mild alkali that causes dirt and grease to disolve in water for easier removal. When it is not fully dissolved, like when sprinkled on a wet sponge, it can act as a mild abrasive. According to the highly regarded Consumers Report, the mild abrassive quality of baking soda makes it effective in removing dirt and stains from bathroom tiles and tubs, and kitchen countertops. Unlike most commercial cleaners that contain fragrances to mask odors, baking sodas deordorizing power is a result of its ability to neutralize odors. Many odors are caused by strong acids (like sour milk) or bases (like spoiled meat). Baking soda reacts with substances that have either strong acid or base pHs. Things that smell bad give off a vapor of strongly acidic particles that baking soda, with its large surface area, will react with and neutralize by making them less acidic. Baking soda can be used to remove odors from furniture, clothing and even our bodies (it can be used as an underarm deodorant or when mixed with water as a mouth wash). Baking soda is commonly added to washing machines as a replacement for softener and to remove odors from clothes. While natural cleaners do work, they simply cannot compare in terms of convenience and effectiveness to harsh chemical cleaners. It will take more work to clean a bathtub with baking soda. There are tradeoffs, but for the benefit our health and that of the environment we may want to consider adjusting our standards of cleanliness in the home. If you’re ready to give natural cleaners a try, here are some recipes from Consumers Report to get you started. There are many more on the internet. Kitchen Counters: For a “soft scrub,” mix baking soda and liquid soap until you get a consistency you like. The amounts don’t have to be perfect. Make only as much as you need, as it dries up quickly. 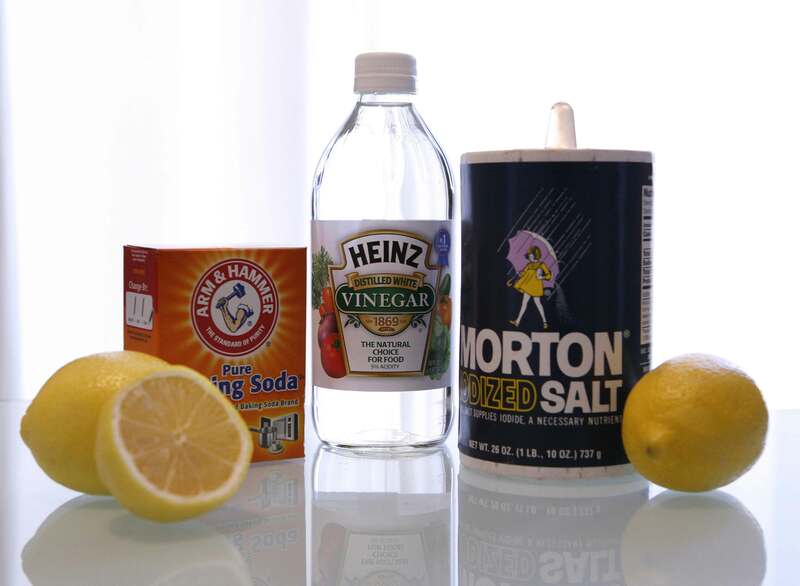 Glass: Put 3 tablespoons vinegar per 1 quart water in a spray bottle. Some recommend using half vinegar and half water. For extra-dirty windows try this: 1/2 teaspoon liquid soap, 3 tablespoons vinegar, and 2 cups of water. Shake well. The best way to get streak-free windows–use newspaper instead of paper towels to wipe them. Bathroom Tub and Tiles: Mix 1 2/3 cup baking soda, 1/2 cup liquid soap, and 1/2 cup water. Then, as the last step, add 2 tablespoons vinegar (if you add the vinegar too early it will react with the baking soda). Immediately apply, wipe, and scrub. Wood floors: Add 1 cup of vinegar per pail of hot water.